Cindi is a happy mom-to-be. Cindi is one happy mom-to-be. 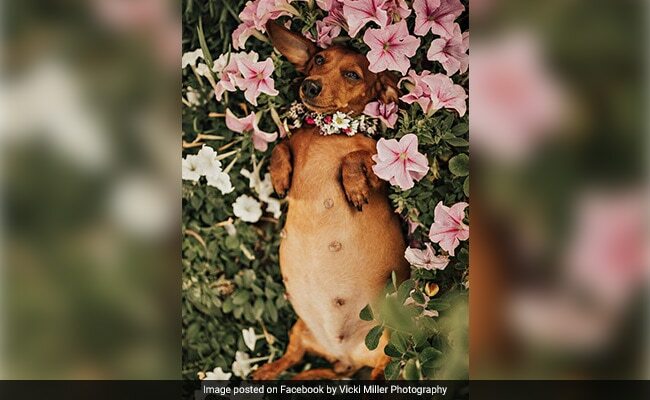 The miniature dachshund, after all, got her own maternity photo shoot – and she looked radiant in all her pics. To celebrate Cindi’s first litter, reports 9 News, her owner Vicki Miller, a professional photographer, organised a maternity photo shoot. The photographer, based in Australia, shared the photos on Facebook on November 13, where they instantly went viral with over 8,000 reactions and 600 shares. “It makes women feel good about themselves when it’s such a miracle of life, and I just wanted Cindi to have the same thing,” Ms Miller said to 9 News. Cindi’s five puppies will get their own photo shoot, confirms Ms Miller. “1k likes in 20 minutes tells you just how freaking cute and funny these are,” writes one commenter on Facebook. “Too cute, can’t wait to see the babies” says another. What do you think of the photos? Let us know using the comments section below.